Fraction Man needs your help! Space aliens are invading, and Fraction Man must fight them off, but he can only hit the alien with a decimal written on it that is equal to a fraction written at the bottom of the screen - it's up to you to work out which one to target and steer Fraction Man to the right place to drive off the invader. This fun game sees you clearing level after level of invading aliens - but the more levels you clear, the harder the questions get. Some of the questions can be quite challenging, so this is useful for up to sixth grade. Each level also sees you travel to different locations around the world - with the backdrop changing to show a picture of Toronto, or London, or Paris, wherever you are doing battle! 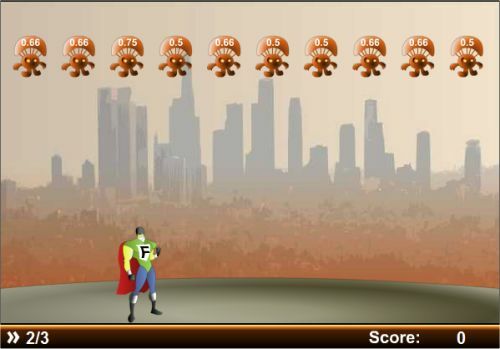 See if your math skills can help Fraction Man turn the alien tide!